AVAILABLE IN THE U.S. ON JULY 26TH! By turns humorous and touching, They Left Us Everything is an unforgettable memoir about family love, loss, and legacies. A disciplined British father, an exuberant Southern mother, five kids, fifty years’ worth of stuff, and the 23-room house that held them all. Plum Johnson’s memoir is a funny, heartfelt story about what parents leave behind. Our old clapboard house is rooted here in this prime location overlooking the lake, a place Mum calls “The Most Beautiful Spot on Earth.” This is where my four younger brothers and I were raised. This is where one of my brothers died. Dad died here, too. I pull into the driveway and step up to what we euphemistically call “the boathouse door.” None of us uses the front door anymore; we all use the boathouse. Dad used to store his sailboat here, between the garage and the house, and eventually roofed it over as a kind of carport to keep off the snow. There hasn’t been a boat here in over forty years. They say you can never go back, but the people who say that haven’t seen this house. Nothing’s been changed since Mum and Dad bought the house in 1952—not even the dining-room wallpaper—and the family who sold it to them had owned it since 1917. You come through the door and think you’re in a time warp. A movie scout for Walt Disney Pictures once walked in here and his eyeballs almost fell out of his head. “Get here quick!” he screamed into his cell phone. “You don’t understand … we won’t even need props!” Which is why there’s a framed picture of me in the living-room scene of The Ref with Kevin Spacey. As I step into the mudroom, the first thing I see is the cast-iron woodstove with home comfort etched on the front. Teetering on top is a tin of powdered dance wax and a potholder with Mum’s Southern message: y’all spoken here! Dangling from the window latches are long metal fly swatters. I hear a faint humming—the summer flies are long dead, so it might be the pipes, or it might be the furnace, or I might be just imagining things. Hanging from wood pegs near the ceiling, next to waterlogged canvas life jackets and stiff straw boaters, are old wooden tennis rackets, screwed by wing nuts into their square wooden presses. Stuck into one of the windowpanes is a plastic sign of a gun aiming straight at your heart: never mind the dog: beware of the owner! She’s in the kitchen, plumped into a chair at the long harvest table, wearing black polyester pants, a red turtleneck sweater, and large white plastic earrings. Her round cheeks are pink and her lips are enlivened with Revlon Red. She has no wrinkles, even in her nineties, and no eyelashes—or at least none that we’ve ever been able to see. She has never plucked her eyebrows or had a facial, something she’s always considered vain and a waste of money: “Men never have facials, they never use face creams … just soap and water … and do they have wrinkles? No! ” Her fingernails are painted red, though, because she will, from time to time, have a manicure. She also dyes her hair brown because, she says, “There’s already too much grey in the world … why would I want to add to it?” Mum loves glitz, so above her diamond engagement ring she wears a gaudy pile of sparkly beads on an elasticized band. On the table are her favourite red sunglasses, shaped like a pair of wide laughing lips. The cowbell on the door handle jingles as I let myself in. Mum looks up expectantly and smiles. “I wish you’d get a hearing aid,” I mutter. The kitchen table—her command central—is piled high with newspaper clippings, Sears flyers, church leaflets, and Christmas cards. Letters from the Publishers Clearing House announce that she’s won a million dollars, and Mum’s already stamped those brown reply envelopes. At the far end of the table, loose photographs of grandchildren and great- grandchildren are propped up in a motley reunion around a vase of plastic flowers, and kitschy feathered roosters perch near the fruit bowl competing for space with her salt and pepper shakers, which are shaped like little pink pigs in waiters’ uniforms. There’s an open tin of homemade shortbread from some well-meaning neighbour and a stack of Biodiesel Smarter magazines, published by one of her grandsons—Mum is a loyal subscriber. Her long-handled magnifying glass lies atop the editorial page of today’s newspaper. The only obvious hint that Mum has a problem is her oxygen tubing. It winds around her ears, across her cheeks, and into her nose, emitting a constant pock-hiss … pock-hiss. Sometimes the tubing falls off her ears. Sometimes she gets so mad she scotch-tapes it to her hair. I walk across to give her a hug, but she throws up her arms like steel rods to keep me at a distance. I bend down and kiss the air beside her cheek. She’s recently had cataracts removed, and I notice that her eyes are covered with a gooey film of gel. “How are your eyes, Mum?” “The same.” She shrugs. Mum says she can’t stand “old people who discuss their ailments.” Everybody’s got problems, she says; it’s just what happens when you get old, so why talk about it? From the top of the fruit bowl she takes a persimmon—my favourite fruit—and shoves it towards me. She’s drawn a smiling face on it with magic marker and tied a ribbon around its middle. I’m pleasantly surprised, because usually Mum gives me cheap, gaudy jewellery, just like hers, and doesn’t even wrap it—she leaves the receipt in the bag. This is the first year she’s given me a consumable … and I like it, which suggests I’m no longer in acquisition mode—I’m happier with gifts that won’t clutter … things I can eat. I look at the brightly painted eyes and upturned lips of the persimmon and think, I must be getting old. How could I, when I have to be here? Mum couldn’t possibly know how I’m feeling—anchored by aging parents. By the time she was thirty-six, both her parents were dead. My resentment bubbles over, so I sidestep her question and try a little dig. “What were you doing when you were sixty-three?” I ask her. My brain is spinning. I’m still thinking about her ophthalmologist. She purses her lips, shakes her head, and tosses her draft back into her pile of debris. I get the feeling she’s shocked by her own lack of power to effect change. “He’s just rude, if you ask me! No manners whatsoever.” She adjusts her oxygen tube and gasps for breath. “Damn this thing!” Mum’s mind can access facts faster than Google—her memory is prodigious. She remembers more about current events than most people and can rattle off an astonishing array of historical data. But politics has always interested her most; her family in Virginia was steeped in it. Her ancestors include Edmund Randolph, who was the first Attorney General of the United States, and Bartholomew Dandridge, who was George Washington’s brother-in-law. She has ancestors buried at Thomas Jefferson’s home, which entitles her to access the cemetery, so she’s delighted she doesn’t have to pay admission when she visits Monticello. When Mum was growing up, Richmond, Virginia, and Washington, D.C., were populated by many of her relatives in positions of power. Two of her cousins later became U.S. ambassadors and her oldest brother was director of Germany’s industrial reconstruction after World War II for the Marshall Plan—which he helped draft. He also served on various councils advising several presidents, from Truman to Kennedy, so Mum felt privy to the backroom dealings of the world stage. She was used to getting the inside scoop. I don’t think Mum realized how unusual this was. She simply believed that if you wanted to change something— anything at all—you just had to make one phone call. To the person in charge. Who was probably a cousin. Which is why her unanswered letter to the director of the Stratford Festival in rural Ontario has, quite literally, taken her breath away. Mum has been on oxygen for years now, ever since she quit smoking (and playing tennis) at the age of eighty-five. Thin, clear plastic tubing—miles of it—snakes through this four-thousand-square-foot house, tethering Mum to a loud, belching, institutional-sized machine located in the upstairs hall outside the guest bedroom. The tubing trails after her wherever she goes like a long, loopy extension cord. Sometimes she forgets she’s tethered and walks one too many times through the front hall, into the dining room, through the pantry, back into the front hall, past the living room, and into the dining room again, encircling herself in an impossible tangle. If she sits on the chairlift to ride up the main staircase, she hauls the tubing into a coiled lasso and slings it over the armrest, as if she’s out to strangle a bull. You’d think her predicament would make anyone swear off smoking for life, but all I want when I’m with her is a cigarette. I just finished your memoir and loved it! Any family whose parents have died has had some form of the sifting through their treasures and “stuff” and all the emotional swings this brings to the surface. As a first daughter born during the war there were parts of your story that brought back vivid memories of my early life and years later reading the “love letters” saved by our Mother. One so often hears of families who are estranged either while parents are aging and need care or after they are gone when dispersing what they left behind, so I was especially impressed with your description of “sibling dinners” and the bidding process you devised for choosing what you wished to take with you. I live in Kingston and am very sorry that I did not see that you were attending until I checked your website so missed the opportunity to hear you read. Thank you for sharing your family story. I’m almost done with your compulsively readable book! I have been most of the day on the couch, alternately laughing and teary-eyed. What I find so interesting is how your experience differs from mine and my sister’s. When our parents died, five weeks apart, we felt in a rush to get rid of nearly everything. And when several boxes of loose old photographs were flooded in my sister’s basement, we both felt relief that we wouldn’t have to do anything else with them. I can’t imagine growing up with your father, yet he obviously loved you all and you all felt the same, tenderly caring for him at home until he died. Your memoir is a long love letter to both of your parents. 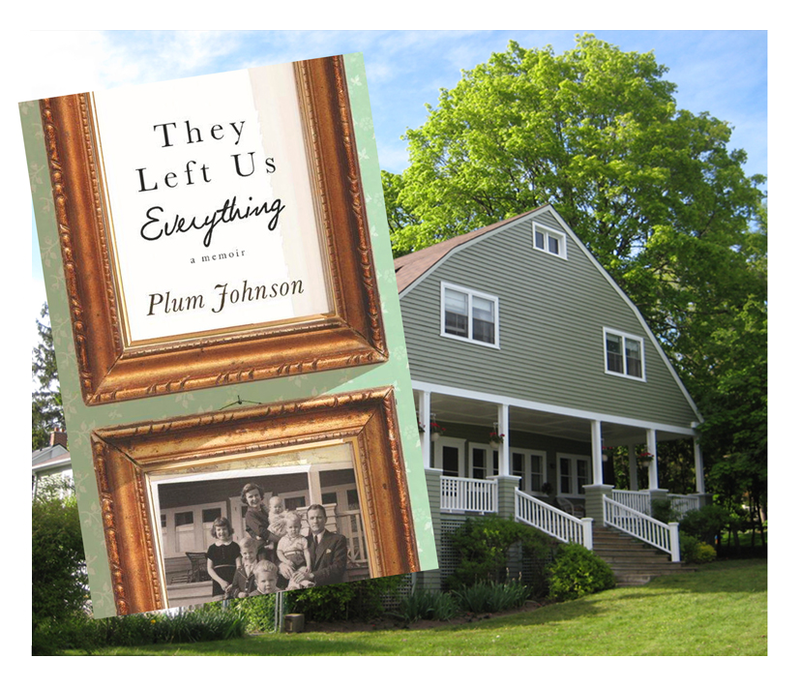 The big reveal: Plum Johnson’s “They Left Us Everything: A Memoir” is our 1st book!! It’s absolutely superb & a well-chosen ‘RBC Taylor Finalist’ 2015! p.s. check out & ‘like’ Plum Johnson on facebook.She’s an Canadian gift! I live in Florida and heard about your book for the first time on WAMU radio out of D.C. Your interview must have been rebroadcasts and happily for me I caught it. Will buy the book on line tomorrow. I’m looking forwrd to it. Regrettably it’s not yet available on Amazon. I searched eBay too. Not there. Maybe it’s not available in the states yet. I’ll keep it on my list and check periodically . It is now available on Amazon. I just ordered some. Try again, worth it! I was reading Plum’s book last night, November 5 when she said it was Nov 5 and she had to set the clocks back. What a coincidence! I had to do the same thing!